I actually made this last weekend but I was so busy I didn’t get a chance to post it so, for a change, you’re getting a recipe for your weekend dinners in time! Get some salmon from the fish market or the supermarket tomorrow and surprise your family with this rich and glamorous yet easy and quick dish. 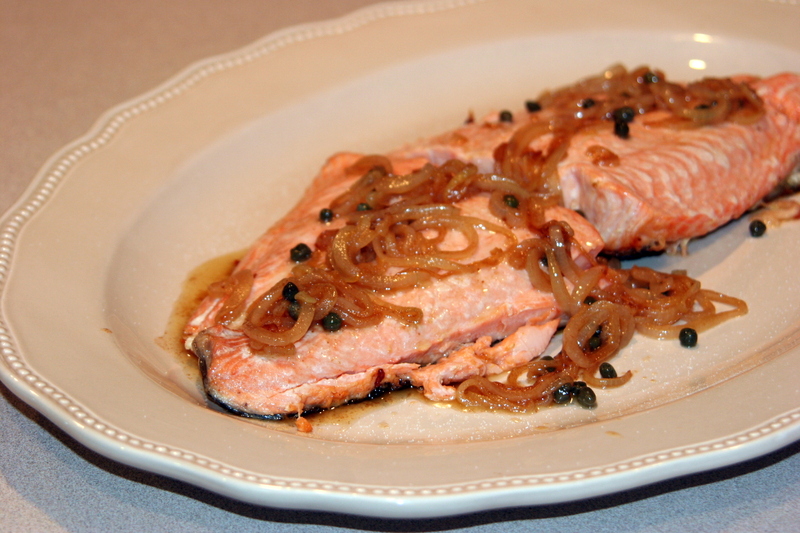 This recipe is from Jacques Pepin and it’s one of my two favorite salmon recipes. The other one is Vicky’s recipe, a modified version of which I posted a while ago. How to make: The secret for this recipe is a good, heavy, non-stick pan and you’ll have your salmon ready in a matter of minutes. Heat the pan for about a minute (no oil or butter). Put salt on both sides of the fillet and lay it in the pan, skin side down. Cover the pan with a tight lid and let it cook for about 8 minutes or more depending on the thickness of the fillet. To check if the fish is cooked, use a fork to see if you can pick the top flake easily. If you can, it’s done. I serve it with its skin. It’s easy to eat just the fish and let the skin on the plate. It peels off very easily. If you prefer, you can remove the skin before serving. That’s it really. You can stop here and serve with a bit of butter on top. Or take another few minutes to prepare the sauce. Wipe the pan clean with a paper towel. Add the butter. Saute the onions for less than a minute. Add the capers and saute for another minute. Add the lemon juice and stir for a few more minutes. Pour the sauce on the fillet and serve with parsley (not shown in the photo because it wasn’t serving time yet).